Hope must be on vacation from The Killing... because any semblance of a positive outcome seemed lost on the heavy-handed bleakness that soaked up the characters and story on "Reckoning." The hour was tough to watch, but difficult in the way it was meant to be, not because of any poor execution or plot. With Pastor Mike's name pretty much cleared after last week's episode, "Try," the likely suspect connected to all the girls reverted back to Joe Mills, who seemed more disheveled than the previous time we saw him. Mills really didn't help his case by pummeling Linden's face to a bloody mess (I was a bit taken aback by the multiple shots he got in on her), but luckily Holder was able to save her and let Linden give a couple return hits while Mills was held down. And with the collection of rings discovered that were taken from the victims, it looked pretty cut and dry who the "Pied Piper" was, even if Mills continually denied it. What was worse and a real shock was the death of Bullet, almost immediately revealed in a dramatic fashion that was played perfectly through one shot of her tattooed wrist, Linden's rush to Holder's side and the look of anguish on Holder's face as he saw her body in the trunk of the cab. I thought that maybe it was Holder coming to reconcile at the end of the previous episode; or if anything, the hour might make us think Bullet was gone. But to actually kill her? Didn't see that one coming. It was tragic watching the upbeat Holder breakdown. First, he was yelling at his girlfriend (who I initially thought might be in the trunk); then he was sitting along in a dark room smoking and drinking feeling upset that he should have done something; and then he went and beat the crap out of his partner after finding out he spoke to Bullet. At the same time, Holder was going off the rails, Linden was there to comfort him. And surprise to the almost kiss between the two detectives! I was waiting for something like that to happen (not sure if I want these two together yet), but there's definitely a connection between them and both actors really pulled out all the dramatic and emotional stops to convey it throughout the hour. It's definitely been great getting good character scenes between the hunt for the killer, including ones that don't necessarily involve Linden and Holder. I'm still trying to figure out Lyric and Twitch's purpose to the larger story beyond just a look at street kids. The same goes for prison guards Becker and Henderson, who the former had his kid arrested after shooting his wife's lover. I'm kind of hoping though that there isn't a bigger connection with these group of characters and rather just seeing a further facet into the lives of those a part of that bigger story, rather than aspects of a twist we have yet to see. So is it really case closed on the Pied Piper and most likely Joe Mills? After all, Adrian Seward pointed Mills out in the photo as the man who killed his mother. But was it a lucky guess or the real deal? Linden got word that Mills wasn't in the area when the original crime that put Ray Seward in prison took place. So... did Mills simply kill the girls and not Seward's wife? Is he innocent? Is Seward? There was no cliffhanger really, and in a lot of ways, the season could have ended right there if it was indeed a case closed without Linden being able to do anything about Seward's execution. Tragic indeed. But with two more episodes to go, that final twist is bound to appear and perhaps spark a ray of possible hope on the dreary city that's pulled Linden and Holder into it's grasp. 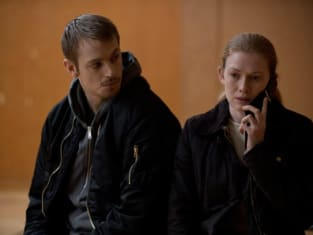 Either way, I can't help but reiterate what a breath of fresh air The Killing Season 3 has been offering that compelling ride even if for now, it hasn't been filled with sunshine and happy endings.